Two small-time crooks and petty thieves, Sunil and Vijay, have a lot in common, although they hate each other’s guts. Both land up in the same prison to do time; both of them also impersonate someone else to get employed in a boys’ boarding school because they want to abduct a student named Bittoo Mathur for a very large sum of money; both have woven tragic-comic background family tales to impress their respective girlfriends, Shalu and Anju; both have changed their names, while Vijay (Amitabh Bhachchan) is Lakhsman, Sunil (Shashi Kapoor) is now Ram; and both are bent upon outwitting the other to abduct Bittoo. Will they be able to succeed? If yes, who will be the one to abduct Bittoo…? 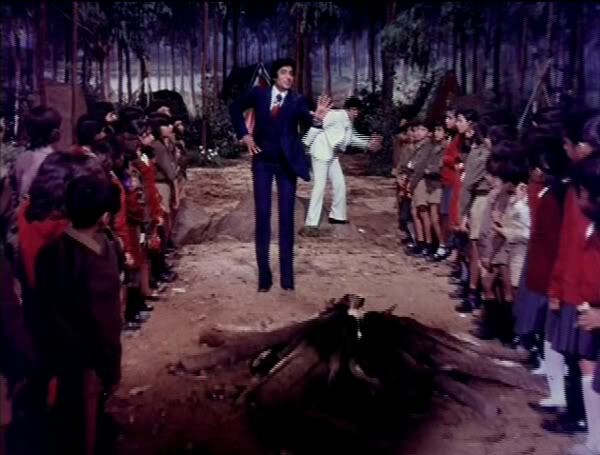 Amitabh stealing Shashi's thunder thanks to a 'gargling' solution...! The whole outcome is totally hilarious and this movie is very close to my heart because my cousin San and I have often watched this movie together and enacted the scenes and sang the songs amid great laughter. The best scene in the whole movie has got to be when Shashi Kapoor gargles with some dodgy stuff that Amitabh Bhachchan had replaced with his original gargling solution and it changes his voice completely. Fast forward to when Parveen Babi passes out in Amitabh’s room and Shashi turns up to sing a song to intimidate Amitabh. That is ever so hilarious! I love that part! 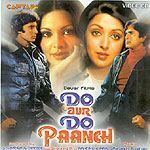 This movie has very fond memories, as do most Amitabh Bhachchan movies, and it is a movie I can watch over and again.